Marie Louise was draped in jewels for that coronation, including a diamond sunburst brooch on her shoulder. The brooch has a large round top portion with rays of diamonds radiating from a central diamond cluster, and a similar, smaller version as a pendant beneath. The brooch's exact origin is not known; Royal Magazin points out that there were a few diamond star brooches among Princess Marie Louise's wedding gifts, including from Queen Victoria. 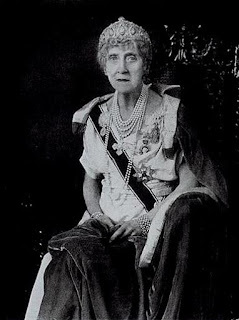 The brooch was also worn by Princess Helena Victoria (1870-1948), Marie Louise's sister. She never married again, and had no children. 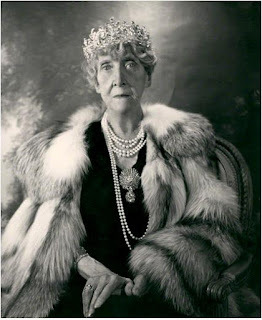 When she passed away in 1956, Princess Marie Louise left jewels to multiple of people, including The Queen. 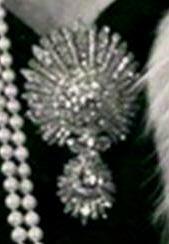 The Cartier Indian Tiara went to her godson, Prince Richard, currently The Duke of Gloucester. The Diamond Sunburst Brooch was inherited by Queen Elizabeth The Queen Mother. The Queen Mother wore the brooch publicly just a couple of times, including for the official family portrait released to mark The Queen and The Duke of Edinburgh's 1972 Silver Wedding. Following her 2002 death, it would have passed to The Queen, where it is still waiting for a reappearance on Her Majesty, or as a loan to The Duchess of Cornwall or another family member. The diamond rays of this brooch are very much like those found in popular Russian fringe/kokoshnik tiara designs, and I can't help but think it's aching to be paired up with one of those classic tiara models.